Stephanie Pettro is a senior in the Bioresource Research major at Oregon State and participating in the bioenergy minor program. 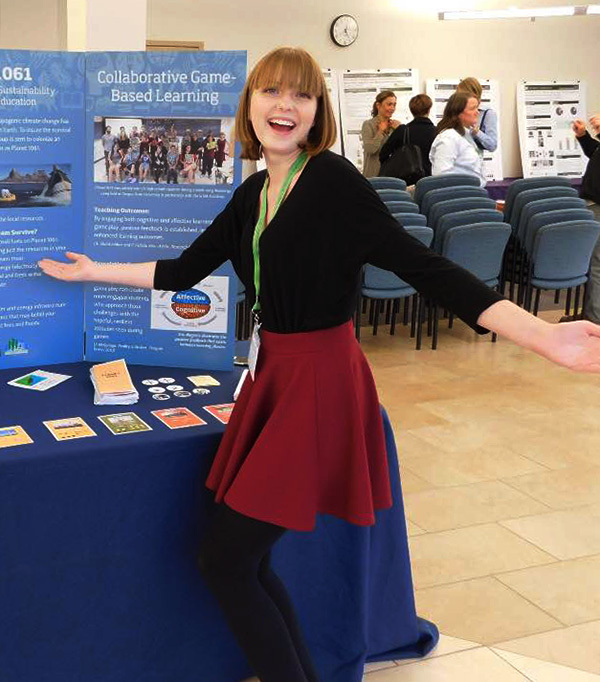 Her work focuses on the utilization of board games as a bioenergy teaching tool for kindergarten through twelfth grade students. When she’s not doing homework or working on her research she is making costumes, going to conventions, and playing dungeons and dragons. My mom brought science into my life at a young age. We would read books together, and watch things like the Discovery Channel and Animal Planet. Whenever I would have questions she would make sure she could answer them, even if it meant taking a trip to the library to get books on whatever I was interested in that week. What interests you about bioenergy? I first became interested in bioenergy after looking into bioproducts as a whole. Utilizing renewable resources in order to get the materials we need is a field of science that has always interested me. Chemical conversions, especially ones stemming from biological processes, was one of my favorite subjects in high school and bioenergy is one of the fields that is looking to utilizing those the most. What are some of the most exciting activities you’ve experienced as a bioenergy minor at OSU? The most exciting experience at OSU was participating in the S.M.I.L.E summer bridge program and creating an interactive game to teach children the concepts of bioenergy. Being able to take what I’ve learned in college and putting it into a format that children could understand is one of the most rewarding things I’ve been able to do with my time here. How has your experience in the bioenergy minor shaped your future plans? The bioenergy minor has shown me just how interdisciplinary the subject is, and with that I have plans of going to graduate school for botany and plant pathology. Much of our bioenergy comes from plants and the growth and management of them is as important when attempting to utilize more bioenergy in the future.